Anything that has been manufactured has an “expiration date.” On food items, that expiration date can be very specific. As for everything else, it really depends on how often you use an item. Consider your lawnmower. Do you remember when you first bought that machine? How many times have you mowed the lawn since then? Like a car, you can keep a lawnmower running efficiently with a little maintenance and blade sharpening. However, sooner or later it might just give out. That doesn’t mean you stop mowing your lawn. Instead, you’ll need a new mower but what about the old lawnmower? That’s where Junk King Chattanooga comes into play. Junk King Chattanooga is a company that is dedicated to keeping homes and businesses clear of clutter. Most of the stuff that you have around your house that you want to get rid of is probably too big to fit into the trashcan. That means, it requires be loaded onto a truck and hauled away to a proper disposal facility. Technically, that can be a DIY weekend chore but why waste your time off? 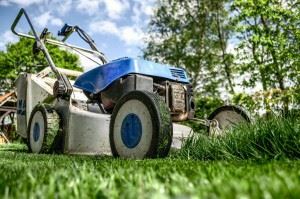 Junk King Chattanooga can make that old lawnmower disappear with a single phone call. The crew working for Junk King will show up in a truck big enough to hold whatever it is you want to get rid of. That can be a push lawnmower or a rider mower. The team from Junk King will efficiently load that machine onto their truck. You could stop right there and still be ahead of the game. But as long as you have the truck and the manpower why not get the rest of your unwanted stuff cleared away in the same session? Take full advantage of this crew to also get rid of things like rusty patio furniture, bricks, construction waste and anything else that is taking up space in your yard. You don’t have to worry about how heavy something is that you want to get rid of. That’s because Junk King is not to charge you by the pound. It all comes down to how tightly they pack up the truck with all your stuff. One flat fee covers all the costs. When you’re ready to get rid of your old lawnmower and the rest of your junk, Junk King Chattanooga will be ready to get it done. This entry was posted in Chattanooga Junk Removal and tagged Junk King, junk removal, lawnmower, rubbish on September 25, 2017 by Junk King. Last updated September 25, 2017 .